During a big storm, Emily hears a loud crash on her Manhattan rooftop and can’t believe her eyes when she goes up to see what caused the noise. 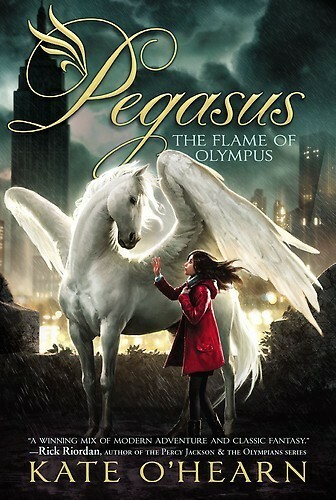 What at first appears to be a horse turns out to be the mythical creature Pegasus, and Emily finds herself immersed in an epic struggle to save both Olympus and Earth from monstrous creatures known as Nirads. Knowing she won’t be able to do this on her own, she enlists the help of Joel, a loner kid who spends time drawing pictures of the legendary Pegasus. Fans of the Percy Jackson series will recognize the plotline involving kids working together with gods on a world saving quest. They will also enjoy learning about Roman mythology this time with the addition of characters like Paelin the thief and goddess Diana. Animal lovers will appreciate the bond formed between Pegasus and the kids working to save his life. War has come to Mt. Olympus. Jupiter armed with his lightning and thunderbolts is leading the defense side by side with his family Juno, Hercules, Diana and her twin Apollo, Mars, Vulcan and Mercury. But powerful and impenetrable as these Gods have always been, this time they are up against a force of Nirad fighters and nothing seems to stop them. In the midst of the battle, a thief watches from behind a pillar, waiting for his once in a lifetime chance to steal the golden bridle from Pegasus, the powerful winged stallion. In the darkest hour of Olympus Paelen the thief betrays the Olympians. As the battle rises to its highest point, the Nirad fighters are racing to the flame of Olympus. If they are able to put out the flame, all will be lost and the Olympians will be no more. In New York City, Emily is watching as a powerful thunderstorm lashes the buildings and streets around her. Hearing an unexpectedly loud crashing sound, she goes up on the rooftop to investigate and finds a winged stallion... it is none other than Pegasus. If Pegasus can penetrate the walls of time and enter into Emily's world, can the Nirad warriors be far behind? Are they the true enemy or does an even more evil, desperate force exist in Emily's own world? This is an adventure story filled with Roman deities who have broken through to our world bringing with them the ultimate battle and revealing the evil waiting among us. I love this book it made me feel for the characters and it kept me on the edge of my seat the whole time.